Australia’s most westerly state capital is bustling, cosmopolitan and independent in spirit. Explore the parks, culture and attractions of Australia’s ‘Cinderella City’. Big science, big sand dunes, big forests and big vineyards. From the coast to the country, from the sky to the sea, adventure awaits. Discover a buzzing mix of history, arts, culture and cafés that’s easy to explore – and easy to enjoy. The local aboriginal tribes have lived in this land of reefs, gorges and caves for more than 45,000 years. Yet compared to the area’s oldest residents, they’ve only just arrived. Discover a new scale of history in the natural wonders of Australia’s Coral Coast. It’s the colour of the beaches of Esperance. It’s the glowing wheat fields of Merredin and Hyden. And it’s the precious metal they pull out of the ground in vast quantities. On it and in it, there’s gold in this part of the outback. Lose yourself in a land of history and natural wonder, with fewer people per square kilometre than anywhere else in the world. Whale and dolphin watching, caving, tree walks, fine wines and wreck-diving await. South of Perth, find a region of exhilaration. It’s been many things in its time: aboriginal prison, boys’ reformatory and internment camp during both World Wars. Today, it’s an A-class reserve of 63 beaches, 20 bays and glorious peace. 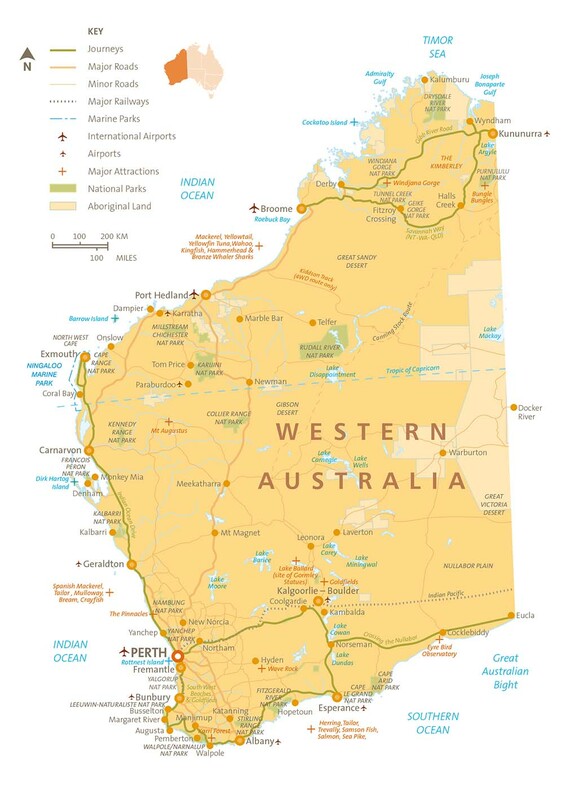 So just how big is Western Australia? At 2,645,615 km², it’s 4 times the size of France and 11 times the size of the UK. If it were a country in its own right, Australia’s largest state would be the world’s 10th largest country.